Camp Galileo mixes day camp fun with hands-on projects in fields from science and engineering to the visual and culinary arts. Kids grow from Camp Galileo (pre-K – 5th grades) through Galileo Summer Quest (entering 5th – 8th grades), emerging as confident creators ready to turn their ideas into reality. 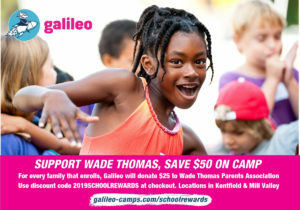 Throughout the month of April, Galileo will donate $25 to the Wade Thomas Parents Association for every family that enrolls at Camp Galileo or Galileo Summer Quest. Plus, you’ll get $50 off camp with code 2019SCHOOLREWARDS. Be sure to enter Wade Thomas as the school during checkout (in the camper info section). Learn more at www.galileo-camps.com or 800-854-3684.